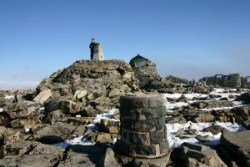 On the 2nd June 2011, Steve Walker and companions set out to do to the Three Peaks Challenge. 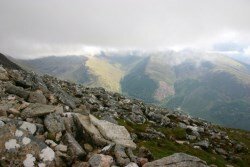 Steve kindly provided his account of the first part of the challenge - walking up Ben Nevis. Like the story, he has provided some excellent photos! Whether you're thinking of doing the whole challenge, or just attempting Ben Nevis the account below is a good description of what you'll be up against. Drinking 12 pints the night before was a mistake, perhaps the first of many. Despite what some would have you believe, beer is not a suitable source of energy, nor is it the best way to prepare yourself for the National Three Peak Challenge. They say that some walk in the rain while others just get wet. We, on the other hand, woke to a fresh Scottish morning with bruised skies and the prospect of sunshine as suggested by an enthusiastic weatherman on the morning television. Only the week before, the same keen meteorologist had been telling us of hurricane wind conditions in Scotland with snow and rain over the mountains to dampen the most enthusiastic of travellers. It was since those reports that weather watching had become a compulsory pastime, and obsession, and as the hour drew closer, it finally seemed we were in luck. Fuelled with the prospect of topping up the tan, we arrived in plenty of time at the Glen Nevis visitor centre to once again, feed our obsessive interest with the weather and to catch our first glimpse of the mountain. Feelings were running high, the reality sinking in of what lay ahead that at 5 pm, this bunch of amateurs would be starting one of the greatest challenges of their lives. “Do you know your pacing?” said a serious looking woman behind the desk of the visitor centre, flanked with information and yet more weather reports. “No. That’s not what I meant,” she replied with distaste. “Errr….” I continued again, clearly oblivious to the true nature of professional map reading and navigation. The woman continued, this time, her words spoken slowly and more deliberately as if she were speaking to a scolded child. For the first time that day, I was silent. Although I could not see them, I could feel the others slipping away from my side and looking at me with new found disrespect. My eyes searched for the bowl of salt on the counter from which to take a pinch in response to the weather news, but there was none. Our obsession with the weather was once again rekindled. By now, the two sharing the walk were so far behind me that if they had taken another step, they would have been out of the door. The woman pointed to the weather map to confirm again what she was saying and raised the other eyebrow to match the first. Her stern look was one of concern subtlety mixed with a tinge of despair that once again, amateurs would be climbing the mountain behind her with all the experience and knowledge of a daffodil. Meanwhile, by the van outside the visit centre, concerns were being shared amongst the team as Gavin and Mick, the two drivers listened intently to the news recently imparted while staring at the sky in bewilderment and disbelief. Moments later, we had found the car park and had taken our ease in the familiar and safe surroundings of an impressive pub with all the feel and majesty of the great hall featured in the legend of Beowulf. Through the picture window at the far end, we sat watching clouds and weather, our attention punctuated with the sight of ruddy-faced walkers coming down off the path having completed their climb looking forward to a drink. Our hour of ascent was fast approaching and the knots in our stomachs tightening with excitement and trepidation as we finalised plans and ordered another drink to steady our nerves. 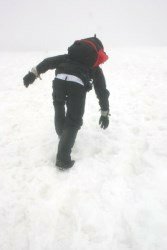 In the car park, a mini bus of serious looking people with expensive weather clothes were preparing for their own three peak challenge, their leader walking amongst them to rally the group with rousing speeches and occasional slaps on the back for support. “I bet he knows what pacing is.” I thought, the humiliating words from the woman in the visitor centre still echoing in my ears as a constant reminder that I should have paid more attention when studying map reading skills in scouts. I looked at the hesitant faces of the other two who would be joining me on my foolish middle-aged venture and wondered what they were thinking. Darren was a similar age to me, a fit man and someone who had served in the army. Danny, on the other hand, was just sixteen, a boy and the son of our driver, Mick who only two nights previously had taken me to one side to utter the words “Make sure you look after my boy!” while waggling his finger at me. I was as worried, as worried as a long-tailed cat in a room full of rocking chairs which was ironic, given rocking chairs were now as rare as rocking horse manure. In my head, I imagined wild weather conditions as foretold by them woman and visions of Danny or Darren falling to oblivion thanks to my incompetence. I was reminded of all the horror stories we had been told, the dangers of inexperience and the warnings we had been given. In the silence that had fallen between us, I swore I could hear the voice of TV’s own Michael Burke narrating another story of rescue and climbing disaster in my head and shuddered at the prospect of being the one who was to blame. “What could possibly go wrong?“ I said with a nervous laugh, hoping my words of enthusiasm would break the new found tension between us. It didn’t. The smart people in the car park were now warming up, their leader conducting stretching exercises and giving last minute advice before their grand departure. Collectively, the sight of people getting ready to go spurred us to leave the warmth of the pub and in the windswept gravel car park, we started to get ready. The weather still looked fine, every blue patch of sky greeted with rapturous cheers of hope as we struggled with gators and waterproofs to prepare for what lay ahead. Hope for the best, prepare for the worst. It wasn’t long before we were ready to leave, the other team now long gone up the stony path and out of view. There was just time for the team photos and the first of many updates on Facebook, which would allow those doubting many at home to follow our progress and share the experience. Pleasantries complete, we watched as the second hand approached 4 pm and as it struck the hour, we were off. There was no going back, no chance of giving up. After all the gushing we had done in the weeks building up to this moment, we had no choice but to complete the challenge. If we failed, it would be a long time before we could show our faces again and even longer before they would stop laughing. The initial walk to the style was easy and all of a sudden the target of reaching the saddle by Lochan Meall an t-Suidhe by 5 pm seemed plausible. Already, Danny and Darren had set a blistering pace and as a dyslexic on a countdown, I began to sweat as I tried to keep up, my personal regret of having put on many layers now evident. A small boy passed us by on the rocky path as it began to climb steeply and turn into steps. He was crying, his mother desperately trying to comfort him as he roared like a banshee. This was not a good sign, a bit like finding a dead camel in the desert is not a good sign when concerned about being thirsty. As the walk became harder and steeper, I replayed the plan in my head to take my mind off the fact my lungs were exploding. We had allowed 6 hours for Ben Nevis, 4 for Scafell and a final, and some may say generous 4 hours for Snowden in anticipation of tired legs and an overwhelming sense of fatigue that would come thanks to a distinct lack of sleep. For the moment, the cloud line way up the mountain ahead of us and posing no real concern. We had been warned how bad the initial climb to the saddle would be, the steep ascent and stone steps a tough awakening and rude way to start. The truth is that words alone do not prepare you for just how hard it actually is, the difficulty far greater than the imagination prepares you for, the pain five times greater than expected. And I can imagine and expected quite a bit. At the stroke of 5 pm, we took stock of our position and caught our breath as we looked back at the zig-zag path behind us. Crowds of people were streaming off the mountain, their hair wet, their clothes bedraggled and yet, smiling from ear to ear as the end of their walk drew closer. We had made the first milestone, a surprise to us all and as we started the more gentle climb going forward, we congratulated ourselves for our achievement and lack of personal hygiene. Predictably, the higher we climbed, the more dramatic the view, the opportunity for photos becoming greater with ever step along the winding path. All the time, we kept a weather eye on the horizon, encouraged by the ever-growing blue sky but acutely aware that the unpredictable Scottish weather had a habit of changing on you without so much as a polite warning or text alert. We had paused to change wet T-shirts now clinging to our bodies like a second skin and had also taken the opportunity to remove several layers of wet weather clothing that for the moment, had been superfluous to the cause and only added to the sweating experience. After 40 minutes, the sweat was dripping in torrents. I used the excuse of taking photos to catch my breath, hoping the others wouldn’t twig that I was already suffering from the climb and me not even one hour into the challenge. As the path turned and climbed further, things did not get easier. The cloud line was still above us, but that did not seem to matter anymore. What was important was the short term target of reaching the saddle by Lochan Meall an t-Suidhe within the first hour, the punishing first climb from the car park not helping things at all. The stops for photos and a drink from the water pouch were, therefore, many indeed. “How much further?” enquired Danny to a passing Chinese lady whose grin was far too wide to belong to a normal person. “Not far, 20 minutes,” she replied as she tried to steady her balance on the ice as she came down. “Yer, right, 20 minutes!” I thought. Raising the poor boy’s hopes and the hopes of all those around us was tantamount to cruelty. There was no way we were that close to the top, especially since we had only been walking for two hours at a pace akin to a Sunday walker going to the pub. Then again, she may have been right. There was no way of knowing just how far we had gone, visibility and cloud cover had put an end to that sort of insight. We decided therefore to ignore the grinning woman and prepared ourselves for at least another hour of sweat and inane conversation as we set off on the ice putting one cautious foot before the other. The wind speed had now increased as we walked higher up the mountain and bringing up our rear was the yellow glow through the clouds from a golden sun desperate to burst through before nightfall had other ideas. Clouds were now thinning, the visibility improving with every step and as the minutes ticked by, the mountain finally conceded and with no warning whatsoever, revealed itself to us in all its glory. The joy, often associated with finding a £10 note in your trousers you never knew you had was overwhelming. Like the clouds from the mountain, a great weight was lifted from our shoulders. With new found visibility also came the sight of the top, just as the woman had promised and truly a welcome sight that was. Joining us in this place were the smart people who had set off a full hour before us, their climb a little more arduous than they had expected. For a hard to reach location, the number at the top were surprisingly many, all smiling, all marvelling at the sights and the drama before them. Clouds, once reluctant to move from the side of the mountain were now pouring over the edge of the cliff like water, a sight that will remain with us for a lifetime. The sky above was crystal blue and for the first time since arriving in Scotland, the sun was shining brightly. Suddenly, we knew the reason for the Chinese woman’s large grin and felt a little guilty for doubting her climbing estimate skills. There were no words to describe the view, no superlatives to do justice to the moment. To put into words, the majesty of the summit would be like trying to describe the colour red to a blind man. Besides, that’s what cameras and poets were invented for. But mainly cameras. After a short, flat walk that involved no pacing whatsoever, we were at the summit. We had hoped for three and a half hours; we had ascended in two hours twenty minutes. The challenge was well and truly alive and for the first time that day, we actually felt that we had a chance of doing this thing. All the fears, all the doubts and all the worries that had been nurtured at the foot of the mountain were gone, blown away with the clouds and off into the mid-distance. Climbing a mountain is optional, coming down a mountain is mandatory. However, we three explorers, the unprepared few had no intention of setting off anytime soon. This was a once in a lifetime opportunity, a moment to savour and enjoy. No amount of pain or sweat spilt along the way could detract from the exhilarating experience at the end of the path and for a brief moment, we soaked up the atmosphere as if we were the first to have ever climbed this bare unforgiving mountain, giddy explorers, the first of our kind. After twenty short minutes of photos and Facebook updates, it was time to wrench ourselves away. The clock was ticking, and it was already a quarter to seven. By now, the clouds had all but gone, and as we made our reluctant decent back to the van, the views, previously denied to us on the way up were abundant and there for all to see. In the distance, Fort William basked in the evening sun, the forecast of storms and high winds now replaced with clear conditions and sunshine that would remain with the region for several days to come. Back at the pub, Mick and Gavin received the phone call from an elated Danny that we were coming down, their cue to stop messing about and to start boiling water for a celebration cup of the lovely brew. The long walk back became an absolute pleasure with views to die for, but not this day. We took great delight in telling people they were “in for a real treat at the top,” not to mention our accurate estimates for exactly how long the top was away and how long they would have to wait before getting there. We had time on our hands, the sun on our backs and as we paused again for yet more photo opportunities, we realised, right there, right then, that there was no better place to be at that moment than standing on the mountain with the world at our feet. It took a full hour and three-quarters to get back, decidedly faster than going up, but that was to be expected. Members of the first team who had set off before us were now returning in dribs and drabs, their times slower than ours, despite the warm up and inspirational back slapping. 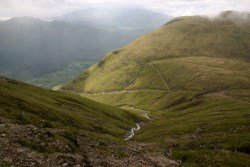 For us, our Ben Nevis Adventure was over, but our big adventure was just about to start as two more mountains awaited us on our three peak challenge. Don’t be fooled. The distance between Ben Nevis and Scafell Pike is long, even if you can’t see anything along the way when driving through the night. If we had known then what we knew now, the smile would have been wiped away, and things would have been very different. But that’s a different story.